OICL AO Recruitment 2018: The Oriental Insurance Company Limited (OICL), one of the leading public sector companies in India, is likely to release the OICL AO Recruitment Notification 2018 for the selection of Administrative Officers (AO). 300+ vacancies are expected this year. Undoubtedly, it is a very good opportunity for candidates who are looking forward to starting their career in the insurance sector. Being an AO for a prime public sector general insurance company like OICL is a matter of prestige and its time you fasten your seat belts and get ready to soar high. OICL has not yet announced the date for the registration, but it is wise for you to start your preparation right away because when it comes to preparing for any entrance exam, the sooner you start, the better. Begin with your studies now to avoid last minute collision. To start with your preparation it is always better to have a general idea about the respective examination and we bring it for you – the OICL AO Recruitment. This article has everything you need to know about the OICL AO Recruitment. Engineers (Automobile) The candidate has to be a Graduate or Post Graduate, having Automobile Engineering as a subject with 60% marks for General Category and 55% for SC/ST. Accounts The candidate should hold an M.Com degree with 60% marks for General (55% for SC/ST) / MBA (Finance) with 60% for General (55% for SC/ST) / ICAI / ICWAI. Legal The candidate should be a graduate in Law with 60% marks for General (55% for SC/ST). Generalists The candidate should be a graduate in any field with 60% marks for General (55% for SC/ST). Medical Officer The candidate should hold an M.B.B.S degree. Actuaries The candidate should be a graduate with 60% marks for General (55% for SC/ST) and should have passed 4 Actuarial Papers from IFoA/IAI. On being selected, candidates have to work for a minimum period of four years including the probation period. If the candidate decides to leave his job or is terminated under any case, he is liable to pay his entire salary he got while working and an additional amount of Rs 40,000 as the partial cost of training. The Final Selection of the candidate takes place on the basis of his Mains and Interview performance. The preliminary examination is an Objective Test consisting of 100 marks. The Mains examination has both Objective and Descriptive Tests (both will be held online) consisting of 200 marks and 30 marks respectively. The Descriptive Test is of 30 minutes duration consisting of 30 marks. This is a test of English Language which consists of Letter Writing and Essay. This will be conducted online. Step 2 Go to “Career” tab and click on the option “Apply Now” that will open a new screen. Step 3 Click on “Click here for New Registration” and enter your “Name”, “Contact Details”, and “E-mail Id”. Step 4 Note down the Provisional Registration number and Password generated. Step 5 Fill in the details required in the application form. Step 6 Upload your passport size colour photograph with dimensions 200*230 pixels. Step 7 Upload your signature of the size of 10kb to 20kb. Step 8 Go through all the details filled by you carefully. Step 9 Go to the “Payment” tab and make payment of OICL AO application fee. Step 10 Click on the “Final Submit Button” and submit your application form. Take a “Print out” of the form for future reference. Start focusing on your studies for a perfect preparation for the OICL AO Recruitment. Finish the OICL AO syllabus thoroughly. Master each and every topic. The more you study and practice, the better it will be for you. You must also take OICL AO mock tests. You can take the Bank Mock Test Series on Embibe that have a similar pattern and syllabus as OICL AO exam. Also, these tests are available for free. 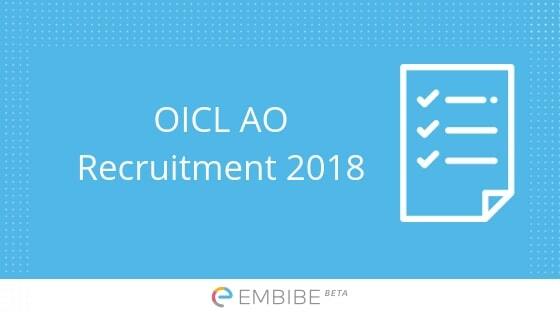 If you have any confusion regarding OICL AO Recruitment 2018 and want us to assist you, drop down your comments below and we will come to you with the perfect solutions. The official authorities have not yet announced any dates for the recruitment. However, the recruitment notice is expected this year. The age limit to apply for the posts is between 21 years to 30 years. 1.Was there any exam conducted for AO oriental post in 2018. There is no notification available for 2018 recruitment and candidates only up to the age of 30 are eligible. However, the exact age criteria and relaxations in the age limit will be clear once the official notification for 2019 is released. LIC is a great place to work for. Great salary and growth opportunities. But LIC AAO notification hasn’t released yet.